STORY: Tibetan spiritual leader the Dalai Lama was admitted to a New Delhi hospital on Tuesday (April 09) with chest infection. The Dalai Lama, who fled to India in early 1959 after a failed uprising against Chinese rule, lives in exile in the northern Indian hill town of Dharamsala. He was flown to New Delhi for a check-up after he felt discomfort. He was being treated for a chest infection and his condition was stable, said media reports. Exiled Tibetans in Dharamsala wished for his speedy recovery. 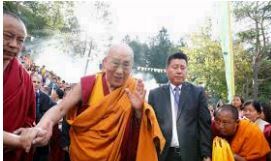 A Tibetan in exile based in the town said he is praying that the Dalai Lama lives longer.